In the early morning, as dawn streaks the gilded peaks of the temples with a rosy brush and the streets below are only beginning to wake, come the monks. Silently they come, wrapped in their saffron robes, alms bowls held before them for the elderly women that respectfully drop food into them. The monks walk in single file, barefoot, the eldest first, the youngest—who may be only a boy of ten years or younger—at the rear, each of them keeping enough distance between them so that no one’s shadow falls upon a fellow monk. The monks are not begging for their sustenance. 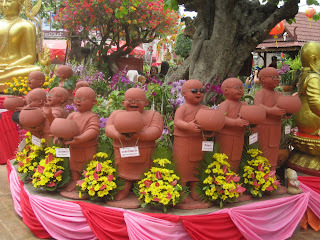 Rather, they are giving their fellow Buddhists a chance to earn merit for themselves through their generosity. Such is the role of the monk; to earn merit, yes, but also to help others do so. Thailand is 95% Buddhist and the influence of the religion is felt everywhere, sometimes subtly, as in a Buddhist amulet worn discretely around the neck beneath a shirt, or more ostentatiously, as in the soaring, gilded wats (monastery complexes) are ubiquitous to the Thai landscape. 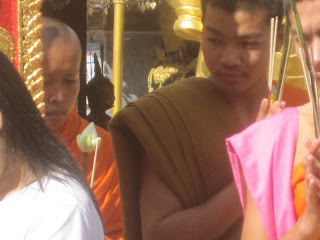 For a Westerner It is difficult to understand that almost every Thai male will spend some time as a monk. That may be a lifetime, or it may be as short as a single day, but it is the rare male that does not spend some time barefoot, wrapped in robes, contemplating the teachings of the Buddha. A man cannot be ordained as a monk until he is at least twenty years old. Until he reaches that age he is considered “unripe,” not yet mature enough to be ready for marriage and responsibility. When a man is ordained into monkhood, he shaves his head, eyebrows, and facial hair and dons the saffron or maroon monastic robes. 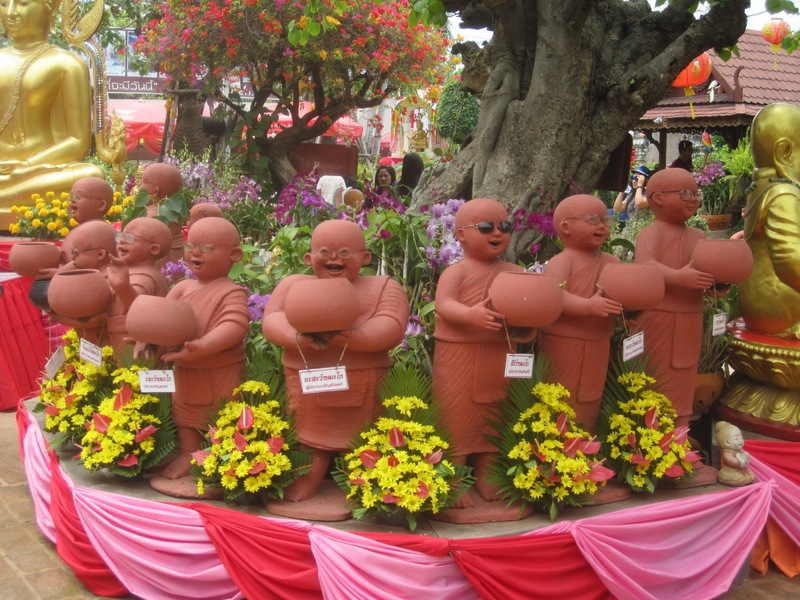 Boys under twenty years of age may also join a wat as a novice. Like the monks, they too shave their heads and wear robes. While novices take only ten vows, monks take 227 vows, including abstinence, poverty, obedience, and chastity—a monk cannot touch a woman, even his mother an anything given to a monk by a woman must first be placed on a cloth or some other receptacle before it can be touched by the monk. Life in the wat is quiet and studious. Most of the time is taken up by religious studies, chanting and meditation, interspersed with some free time for individual study. Monks begin their day with chanting and meditation at 4 a.m., leaving the monastery at 6 a.m. for their rounds of the neighborhood with their alms bowl. Breakfast is at 8 a.m. with the last meal of the day being taken at about noon. After that are more classes, chanting and meditation until bedtime. 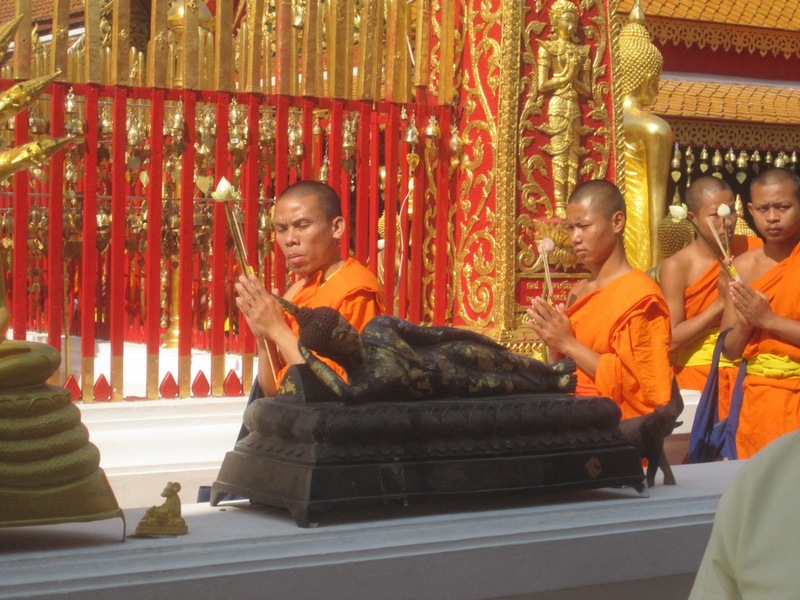 Unlike cloistered monks of other faiths, Buddhist monks are very much in evidence in the community. Besides their morning rounds, they are often seen coming and going to and from the wat; browsing in the markets (especially amulet markets and book stalls); riding buses and motorcycle taxis (“motocys”), and, of course, going about their daily routines in the wats, which are open to the public. 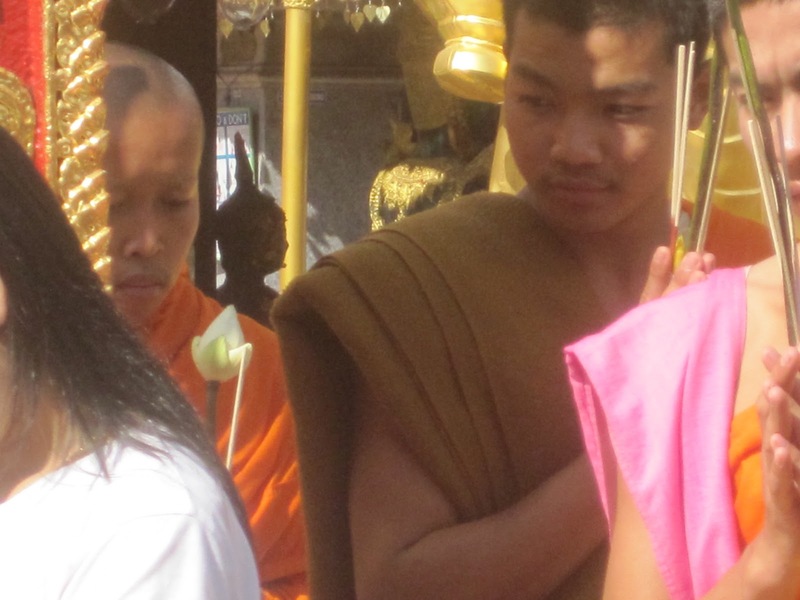 The monks are so visibly present in the community in order to continually remind people of the Buddha and his teachings and to provide a means by which people can earn merit, especially through alms-giving. What does it say about a country in which all the men become monks? Certainly the people of Thailand, their friendly natures notwithstanding, are neither more nor less saintly or holy than the rest of us. Yet, is there not something gained, even if only fleetingly, when one turns away from the mundane world to concentrate on the divine, however that divinity may be perceived? Is there not hope that such a fermata may take hold in one or several of us? And if that happens, is there not hope that in that stillness divinity can make itself known to all?